Cornwall's county town and only city is Truro, situated at 50° 15' 48 N, 5° 03' 04 W. The county covers an area of 1,376 square miles (3,563 km²), and includes the Isles of Scilly, 28 miles offshore. Cornwall has a relatively low population at 513,527, and population density at 144 people per square kilometre. Cornwall is the poorest region in the United Kingdom. Somewhere between 6% and 55% (sources differ) of Cornish people do not consider themselves to be English, and regard Cornwall as a Celtic home nation and Duchy of the UK. It should be noted that Cornwall, the county, has been described as a Duchy on occasion by official bodies. The revival of the Cornish language in the 20th century has boosted Cornish cultural identity, and although currently less than 0.1% of the population speak it fluently, it is taught in many schools and used in religious and civic ceremonies. The modern English name is likely to derive from the same root as Wales (Walea, meaning foreigner) combined with its Roman name of Cornubia. It is also proposed that it may derive from the Celtic tribe of the Cornovii. A people of this name are known, from Roman sources, to have lived in the Outer Powys to Shropshire area of the later Wales and England. One theory suggests that a contingent was sent to the West Country in order to rule the land there and keep out the invading Irish. A similar situation occurred in North Wales. However, there is no evidence for this move west, and Cornish place names of a similar age indicate that there was an independent tribe of Cornovii in the West Country. The Romans knew the area as Cornubia, probably a sub-kingdom of the greater Dumnonia that covered much of the West Country at that time, while in Cornish it was known as Kernow or Curnow; a name which has regained some currency today. It is worthy of note that on many maps produced before the 18th century Cornwall was depicted as a nation of Great Britain; famous example are Gerardus Mercator's Atlas and the famous Mappa Mundi. Cornwall was the principal source of tin for the civilisations of the ancient Mediterranean, and at one time the Cornish were the world's foremost experts at mining. As Cornwall's reserves of tin began to be exhausted many Cornishmen emigrated to places such as the Americas, Australia, New Zealand and South Africa where their skills were in demand. The Cornish Rebellion of 1497 is attributed to Tin miners. The tin mines in Cornwall are now economically worked-out at current prices, but the expertise and culture of the Cornish tin miners lives on in a number of places around the world. It is said that, wherever you may go in the world, if you see a hole in the ground, you'll find a Cornishman at the bottom of it. Several Cornish mining words are in use in English language mining terminology, such as costean, gunnies, and vug. In 1841 there were nine hundreds of Cornwall: Stratton, Lesneweth and Trigg; East and West; Powder; Pydar; Kerrier and Penwith. The shire suffix has been attached to several of these, notably: the first three formed Triggshire; East and West appear to be divisions of Wivelshire; Powdershire and Pydarshire. 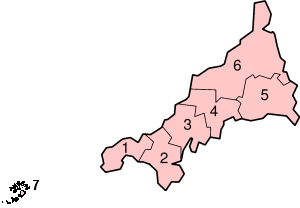 The old names of Kerrier and Penwith have been re-used for modern local government districts. Caradon, Carrick, Kerrier, North Cornwall, Penwith, Restormel, and the Isles of Scilly compose the modern civil parishes of Cornwall. Since the decline of tin mining, agriculture and fishing, the area's economy has become increasingly dependent on tourism — some of Britain's most spectacular coastal scenery can be found here. However Cornwall is the poorest county in England and it has been granted Objective 1 status by the EU. A political party, Mebyon Kernow, the MK, or 'Sons of Cornwall', was formed in 1951 to attempt to assert some degree of autonomy; although increasingly the flag of St. Piran is seen across Cornwall at protests and demonstrations, the party has not achieved significant success at the ballot box, although they do have some councillors. Recently there have been some developments in the recognition of Cornish identity or ethnicity. In 2001 for the first time in the UK the inhabitants of Cornwall could record their ethnicity as Cornish on the national census and in 2004 the schools census in Cornwall carried a Cornish option as a subdivision of white British. Cornwall, being exposed to the full force of the Atlantic Ocean, is composed entirely of resistant rocks, as less resistant rocks have been eroded away. The centre of the county is largely Devonian sandstone and slate. The north east of the county lies on Carboniferous sandstone. Cornwall is particularly known for its igneous outcrops, which include the granite of Bodmin Moor and the areas around Camborne and Land's End, and the dark green serpentine of the Lizard Peninsula. The granite forms high treeless moors on which sheep graze, and the characteristic Cornish cliffs. Cornwall is the southernmost county of the British Isles, and therefore has a relatively warm and sunny climate. However, being unprotected from the Atlantic it also has more extreme weather. 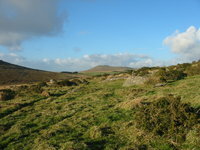 The average annual temperature for most of the county is 10.2 to 12 degrees Celsius, with slightly lower temperatures on the moors. The county has relatively high rainfall, though less than more northern areas of the west coast, at 1051 to 1290 mm per year. Most of the county enjoys over 1541 hours of sunshine per year. Parliamentary representation for Cornwall is dominated by the Liberal Democrats. Currently all five of the Cornish MPs are Liberal Democrat. Two of the current MPs — Andrew George, MP for St Ives; and Dan Rogerson, MP for North Cornwall — repeated their Parliamentary oaths in Cornish. The local councils also have a large portion of Lib Dem members. Most local Liberal Democrat MPs and councillors strongly support moves for devolved agencies and governance to Cornwall, as do some Welsh nationalists. Although Cornwall is a county of England, an independence movement exists that seeks more autonomy. Additionally some groups and individuals question the constitutional status of Cornwall and its relation to the Duchy of Cornwall. Cornish nationalists have organised into two political parties: Mebyon Kernow and the Cornish Nationalist Party. In addition to the political parties the Cornish Stannary Parliament acts as a pressure group on Cornish constitutional issues and Cornwall 2000 the Human Rights organisation works with Cornish cultural issues. In November 2000 the Cornish Constitutional Convention was formed. It is a cross-party organisation including representatives from the private, public and voluntary sectors, of all political parties and none. Between 5 March 2000 and December 2001, the campaign for a Cornish Assembly collected the signatures of 41,650 Cornish residents endorsing the Declaration for a Cornish Assembly, in total 50,546 including people outside Cornwall. The British government however has no plans to devolve more power to Cornwall and the issue does not receive much political or media attention. Cornwall is one of the smaller counties by population and has around a fifth of the population of what is the smallest region of England. There is some dispute about whether the patron saint of Cornwall is Saint Michael, Saint Petroc or Saint Piran. Saint Piran is the most popular of the three; his emblem (a vertical white cross on a black background) is recognised as the flag of Cornwall, and his day (March 5) is celebrated by Cornish people around the world. The Saint Piran's Flag even features on the packaging for Ginster's Cornish pasties to advertise their status as a Cornwall-based company. Cornwall's population is 513,527, and population density 144 people per square kilometre, ranking the county 40th and 41st respectively compared to the other 47 counties of England. 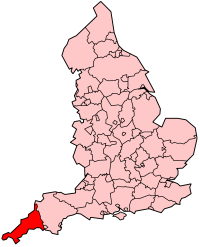 Cornwall has a relatively high level of population growth, however, at 11.2% in the 1980s and 5.3% in the 1990s, giving it the fifth highest population growth of the English counties. The natural change has been a small population decline, and the population increase is due to immigration into the county. Cornwall has a relatively high retired population, with 22.9% of pensionable age, compared to 20.3% for the United Kingdom. This may be due to a combination of Cornwall's rural and coastal geography, popular as a retirement location, and due to the emigration of younger residents to more economically diverse areas. Cornwall is the poorest region in the United Kingdom. The GDP is 62% of the national average. Cornwall is one of four UK regions that qualifies for poverty-related grants from the EU (European Social Fund). Today, the Cornish economy depends heavily on its successful tourist industry, which makes up around a quarter of the Cornish economy. In particular, Newquay is a popular destination for surfers. In recent years, the Eden Project has been a major financial success. Other industries are fishing, although this has been significantly damaged by EU fishing policies, and agriculture, which has also declined significantly. Mining of tin and copper was also an industry, but today no longer exists, and several defunct mines have applied for status as UNESCO World Heritage Sites. The Cornish language is closely related to Welsh and Breton, and less so to Irish, Scots Gaelic and Manx. It continued as a living Celtic language until 1777 and the death of Dolly Pentreath, the last person thought to have used only the Cornish language (although this is disputed on a number of counts). The publication of Henry Jenner's "Handbook of the Cornish Language" in 1904 caused a resurgence of interest in the Cornish language and efforts are being made to revive it. Although there has never been a census, there are some 2,000 Cornish speakers, 100–150 of whom are fluent. It has recently been officially recognised by the UK government as a minority language. Some Cornish surnames are prefixed by Tre, Pol, or Pen, as indicated in the rhyme "by Tre, Pol and Pen ye shall know Cornishmen." These come from Cornish language words meaning, respectively, town (or farm), pool, and head. The Institute of Cornish Studies, established in 1970, is a branch of the University of Exeter, and now part of the Combined Universities in Cornwall Campus at Tremough, Penryn. Philip Payton, professor Cornish studies, has written a history of Cornwall as well as editing the Cornish studies series, and other academics, including Mark Stoyle of the University of Southampton and John Angarrack of the human rights organisation Cornwall 2000, have also produced work on Cornish culture. A detailed overview of literature is provided by A. M. Kent's 'The Literature of Cornwall'. It covers everything from Medieval mystery plays to more recent literary works that draw on the Cornish landscape. Notable Cornish writers include Arthur Quiller-Couch alias "Q", the deaf short story writer, Jack Clemo and D. M. Thomas acclaimed author and poet. Cornwall also produced a substantial amount of passion plays during the Middle Ages. Many are still extant, and provide valuable information about the Cornish language. Daphne du Maurier lived in Cornwall and set many of her novels there, including Rebecca, Jamaica Inn, Frenchman's Creek, My Cousin Rachel, and The House on the Strand. She is also noted for writing Vanishing Cornwall. Charles de Lint's novel The Little Country, Winston Graham's series Poldark, Kate Tremayne's Adam Loveday series, Susan Cooper's novels Over Sea, Under Stone and Greenwitch, Mary Wesley's The Camomile Lawn and Gilbert and Sullivan's musical The Pirates of Penzance are all set in Cornwall. Traditionally, the Cornish have been nonconformists, in religion. Celtic Christianity was a feature of Cornwall and many Cornish saints are commemorated in legends, churches and place names. The Methodism of John Wesley also proved to be very popular with the working classes in Cornwall in the 18th century. Cornwall has shared in the post-World War II decline in British religious feeling. In 2003, a campaign group was formed called Fry an Spyrys (free the spirit in Cornish). It is dedicated to disestablishing the Church of England in Cornwall. Cornwall has a rich and vibrant folk music tradition which has survived into the present. Cornwall is well known for its unusual folk survivals such as Mummers Plays, the Furry Dance in Helston, and Obby Oss in Padstow. Cornish players are regular participants in inter-Celtic festivals, and Cornwall itself has several lively inter-Celtic festivals such as Perranporth's folk festival. Cornwall has its own unique form of wrestling related to Breton wrestling. Cornwall's other county sport is hurling, a kind of medieval football played with a silver ball. Hurling is distinct from Irish Hurling. The sport now takes place in St Columb and St Ives although hurling of a silver ball is part of the beating the bounds ceremony at Bodmin every five years. Rugby has a larger following in Cornwall than football, with the Cornish Pirates RFC, Launceston RFC and Redruth RFC in the national leagues. The county team often drawing very large crowds of supporters, dubbed Trelawny's Army. 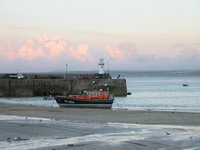 Due to its large coastline, various maritime sports are popular in Cornwall, notably sailing and surfing. International events in both are held in Cornwall. Cornwall will host the Inter-Celtic Watersports Festival in 2006. Euchre is a popular card game in Cornwall, it is normally a game for four players consisting of two teams. Its origins are unclear but some claim it is a Cornish game. There are several leagues in Cornwall at present. Cornwall is famous for its pasties (a pastry dish - traditionally a Cornish Pasty contains meat and vegetables, often peppered), but saffron buns, Cornish Heavy (Hevva) Cake, Cornish fairings (biscuit), Cornish fudge and Cornish ice cream are also quite common. Cornwall with the South West shares clotted cream and many types of cider. There are also many types of beers brewed in Cornwall– the St Austell brewery is the best-known – including a stout and there is some small scale production of wine. Rodda's cream (a creamery based in Cornwall) is eaten by the queen at Christmas. This is a list of the main towns and cities in the county. The Isles of Scilly have in some periods been served by the same county administration as Cornwall, but are today a separate Unitary Authority. Some secessionists have found the phrase "English Heritage" to be controversial, and in 2003, there has been a general move to replace these signs, and the Tudor Rose with the Cornish flag, after a group started removing them. Cornwall borders the county of Devon at the River Tamar. Major road links between Cornwall and the rest of England are the A38 which crosses the Tamar at Plymouth via the Tamar Bridge, and the A30 which crosses the border south of Launceston. A car ferry also links Plymouth with the town of Torpoint on the opposite side of the Hamoaze. A rail bridge, the Royal Albert Bridge, built by Isambard Kingdom Brunel (1859) provides the only other major transport link. Newquay has an airport which has flights from London Gatwick, London Stansted, Bristol, Manchester, Leeds Bradford, Dublin, Birmingham, Durham Tees Valley and a flight to Málaga has recently been announced. The airport shares RAF St Mawgan's runways and facilities; however, this is under threat as the Ministry of Defence is planning to mothball the base.